When I’m trying to figure out what to bake each Christmas, whether something looks like it would be tasty is always the first and most important criterion. Once that threshold is passed, however, I’m always looking for something with color and texture that will add a little dash to the cookie tins, and I also like to try recipes that are different from what I already prepare. This recipe, which I found on the www.dinneratthezoo.com website, meets all of those requirements. The cookies are made with cornflakes, which sounds intriguing, they look great, and they are “no bake” cookies that supposedly can be made in 10 minutes — which is something I’ve not tried before. Line a sheet pan with parchment paper or a silicone baking mat. Place the marshmallows and butter in a large bowl, and microwave them in 30 second increments until melted. Add the green food coloring and vanilla and stir until the marshmallow mixture is smooth. Add the cornflakes to the bowl and gently stir to coat the cereal evenly with the marshmallow mixture. Pack the mixture into a greased 1/4 cup measuring cup, then turn the mixture out onto the sheet pan. Use your fingers to make a hole in the middle to form a wreath shape and decorate with red candies. (The recommendation from the website is that it’s easiest to form the wreath holes if your fingers are damp or coated in cooking spray.) Cool completely until firm and serve. Every would-be cookie baker needs a taster — that person who will sample your fare and tell you whether the batch is brilliant . . . or a bust. I’m blessed to have the greatest taster of all under our roof, so when Kish sent along some holiday cookie recipes from the New York Times I had to pick one to try this year. I like coconut, so this was my choice. Using an electric mixer and medium bowl, beat butter, granulated sugar, brown sugar and vanilla on medium-high speed for 3 to 5 minutes, until light and fluffy. Use a spatula to scrape down sides of bowl, then put mixer on low speed and slowly add flour, followed by 1/2 cup coconut and beat until blended. Divide dough in half and place each half on a piece of plastic wrap. Sprinkle each piece of dough with half of the cinnamon, then fold plastic over to cover dough and use your hands to form dough into a log shape about 1 1/2 to 2 inches in diameter. Chill logs in the refrigerator for 1 1/2 hours, until they are firm. Heat oven to 350 degrees and line baking sheet with parchment paper. Brush outside of logs with egg wash, then roll logs in unsweetened coconut. Slice each log into 1/4-inch rounds. Dip each round on one side into sanding sugar and arrange on backing sheet, sugar side up, 1 inch apart. Bake cookies 10-12 minutes, until edges are just beginning to brown. The calendar — and, unfortunately, the too-early winter weather — confirm that it is indeed December. In fact, it’s December 5. December 5!! That means it’s high time to start collecting the Christmas cookie recipes that I’ll be baking this year. If you like Christmas cookie recipes, the internet is truly a mixed blessing. It’s great in that there are countless cookie recipes that can be called up by running a simple Google search for “Christmas cookie recipes,” which will give you awesome variety and concoctions that you’ve never even thought were possible. It’s bad, however, because at many websites Christmas cookie recipes are classic clickbait, and you need to click through multiple pages to finally get to the recipes. If you hate the constant clicking, as I do, because you believe the website is treating you like a pawn in an advertising game whose time is of no value, I recommend the iambaker.net website, which allows you to get directly to the recipes like the one below. Heat oven to 350 degrees F. Mix the butter and cornstarch until well combined and lighter in color, then turn the mixer off and add in confectioners sugar. With the mixer on low, add the peppermint extract and mix until ingredients are fully incorporated. Turn mixer off again and add flour, then with the mixer on low to medium-low, mix until the dough comes together and pulls away from sides of the bowl. Using a 1 tablespoon cookie scoop or a tablespoon measuring spoon, remove about a tablespoon of dough. Place on parchment lined cookie sheet at least 2 inches apart. Once the cookie sheet is full, gently roll each scoop of dough between your hands until it is a smooth ball. Bake 9 minutes at 350 degrees. Right out of the oven take a glass with a flat bottom (that is smaller than the cookie) and gently press into the cookie. Allow cookies to cool for about 5 minutes and then move to a cooling rack. Make sure cookies are completely cool before adding glaze. Mom and Grandma Webner had a Betty Crocker cookbook in the kitchen, and Kish’s Mom did, too. So when the time comes to look for some new Christmas cookie recipes to try this year, the Betty Crocker website — hey, who actually messes with looking at a book anymore? — is one of the first places I check out. I’ve been brought up to trust Betty, and her website always has lots of good options. I’m always on the lookout, too, for different options for bar cookies, and for some new ways to add a little color, variety, and eye-catching zing to the collection of cookies I’ll be putting into tins and sending out to my friends. The recipe below caught my eye because of its color, shape, and use of cranberries, a perennial holiday favorite. And since I like the taste of cranberries, how can I resist? Heat oven to 350 degrees and spray 13×9-inch pan with cooking spray. In large bowl, stir cookie mix, 1/2 cup softened butter, 4 oz. cream cheese and egg with spoon until soft dough forms. Stir in 1/4 cup cranberries and the white chocolate chips. Spread dough in bottom of pan. Bake 20 to 23 minutes or until golden brown. Cool completely on cooling rack, about 1 hour. In large bowl, beat 8 oz. cream cheese and 1/4 cup softened butter with electric mixer on medium-high speed until smooth. Beat in vanilla. On low speed, beat in powdered sugar until frosting is smooth and creamy. Spread frosting over top of bars; sprinkle 1/3 cup cranberries over frosting. Cut into 6 rows by 4 rows. Store covered in refrigerator. This morning Kish sent me a link to the New York Times “Christmas Cookie Plate” — their listing of Christmas cookie recipes from the Times Cooking section. It’s the kind of thoughtful gesture that makes her the best wife ever. The Christmas Cookie Plate offers an impressive array of cookie recipes, but one in particular caught my eye. I’m a sucker for spice cookies and have been making Dutch Spice cookies ever since I started doing holiday baking years ago. The recipe below for Grammy’s Spice cookies, though, includes a lot of spice — plus heavy cream and Irish whiskey in the icing. I’m guessing that Grammy’s house was pretty festive. Preheat oven to 375 degrees. Line several baking sheets with parchment paper or nonstick liners. Using an electric mixer, beat 12 tablespoons butter with the sugar, molasses and egg until fluffy, about 2 minutes. Slowly beat in flour, baking soda, spices and salt. Shape dough into walnut-size balls and place 2 inches apart on baking sheets. Bake until firm, about 10 to 12 minutes. Let cool on wire racks. To make the icing, slowy beat remaining butter (4 tablespoons) butter with confectioners’ sugar until smooth. 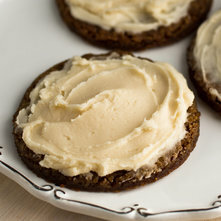 Beat in vanilla and enough cream or milk, and whiskey if using, to make a spreadable frosting. Use on fully cooled cookies.